Aysha Bey will lead a discussion of House of Names by Colm Toibin. Pulitzer Prize winner Marilynne Robinson and International IMPAC Dublin Literary Award winner Colm Tóibín sit down with the CBC’s Eleanor Wachtel for a riveting discussion about their most recent works. The WOMEN WE'D LIKE TO LUNCH WITH BOOK CLUB will discuss The Testament of Mary by Colm Tóibín. Irish writer Colm Tóibín, born in 1955, worked as a journalist before achieving fame as a fiction writer. His works often depict Irish society and explore themes of creativity and homosexuality. Colm Tóibín's book Death in Spring was available from LibraryThing Early Reviewers. 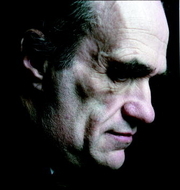 Colm Tóibín is currently considered a "single author." If one or more works are by a distinct, homonymous authors, go ahead and split the author. Colm Tóibín is composed of 24 names. You can examine and separate out names.